Nona, Papa, and I practice looking a lot. You wouldn’t think that looking — or observing — takes practice, would you? Yet, the more I practice, the more I realize that I miss seeing what’s right in front of my face. I need more practice to be good at looking to see what’s there. What I had missed but what was clearly there for me to see was a laboring ant moving a big piece of food — big compared to the ant. What a strong ant! 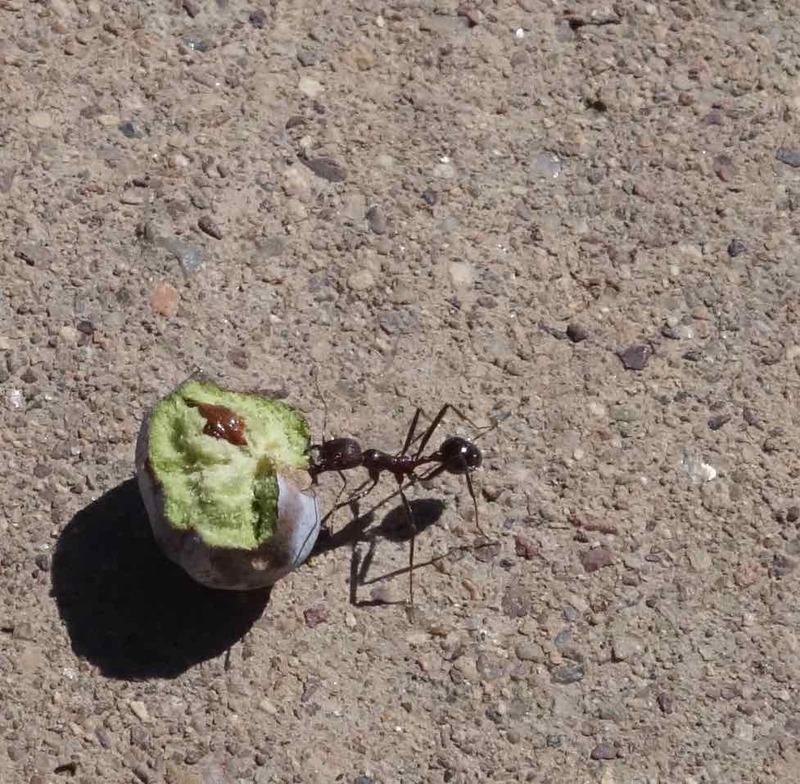 I would have missed the ant with its vegetable burden payload, if Papa hadn’t pointed it out. That’s another thing about looking: we have to help each other to see things. Also, we need to pay attention when someone points out something to see. On the one hand, looking isn’t easy, but, on the other hand, it doesn’t hurt and can be fun, and you can learn things from what you see and others miss. When we walked the pathways nearby San Pedro House, not far from our place in Sierra Vista, Arizona, we enjoyed looking at this pond. 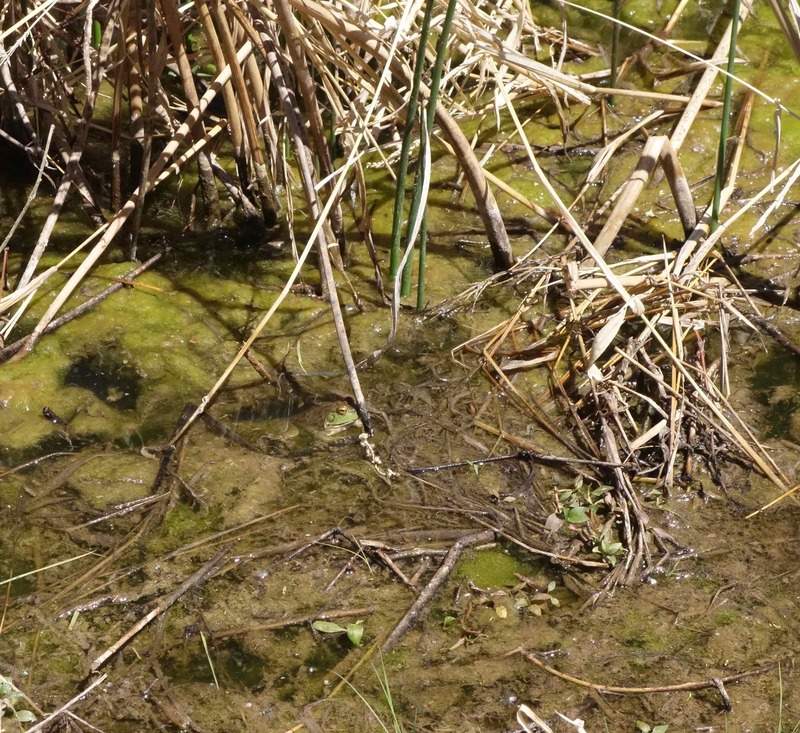 Pond water, reeds, maybe some algae, that’s about it, right? Wrong! Well, we heard something. Water doesn’t make that sound. Neither do reeds, not even in a strong wind. Algae doesn’t either. Papa knew that sound from the days when he had grown up on a farm. “That’s a frog. 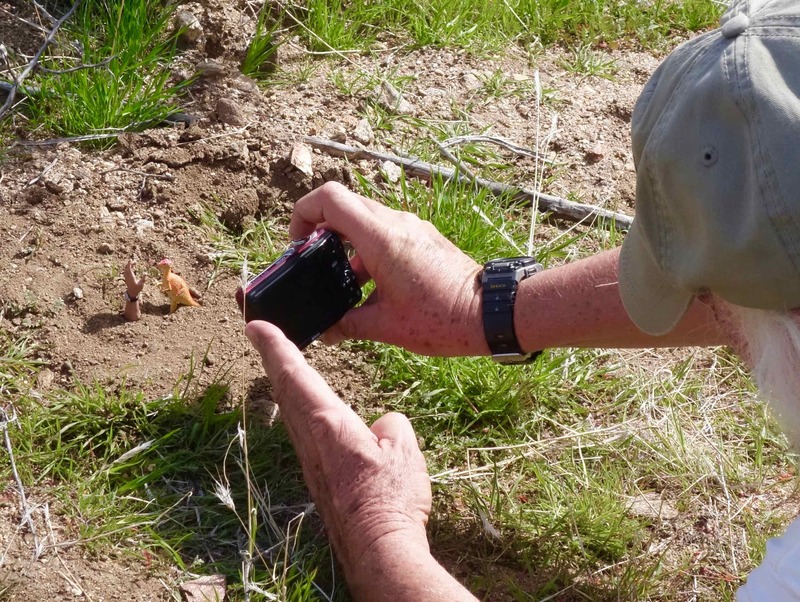 Maybe we can find it if we look really hard,” Papa encouraged us. There’s a dispute who found the frog first, Nona or me. She used her binoculars, and I didn’t, so I should get the credit. Nona put that circle on the picture though. We had to keep pointing to the frog because Papa just couldn’t find it. 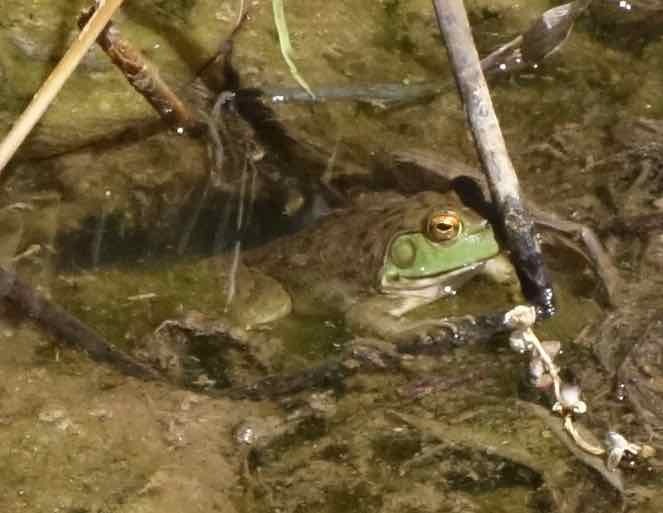 It kept croaking away, and Papa kept asking “Where is it?” I wonder if maybe he needs glasses for distance? 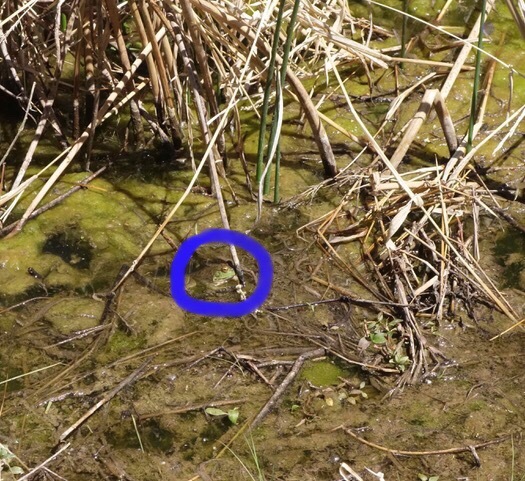 You can see that the frog is well designed to be very hard to find. 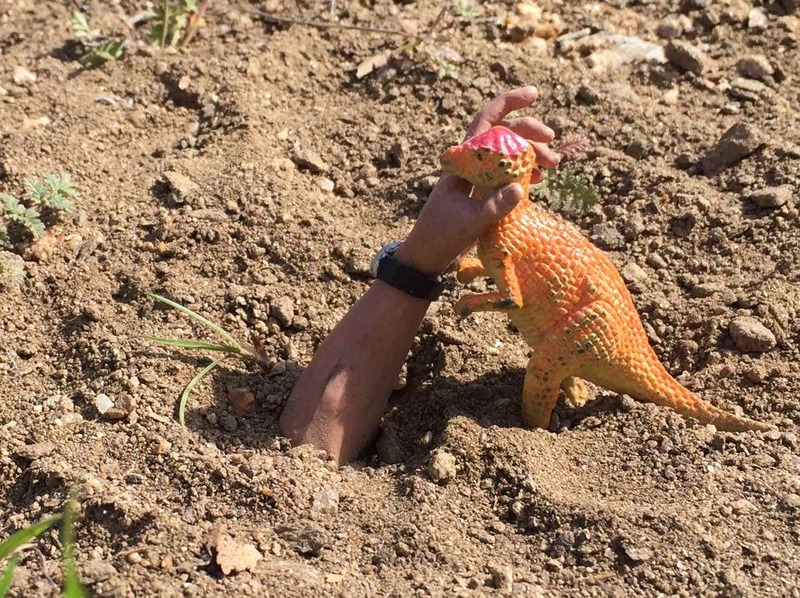 That helps the frog escape predators, like hawks, snakes, and people. I think we were able to look for birds and find them more easily than the frogs. Often, we would hear the birds singing first. Then we’d look in the direction of the sound, and then we might find them. That’s how we found this bird. Isn’t it interesting how ears help our eyes? 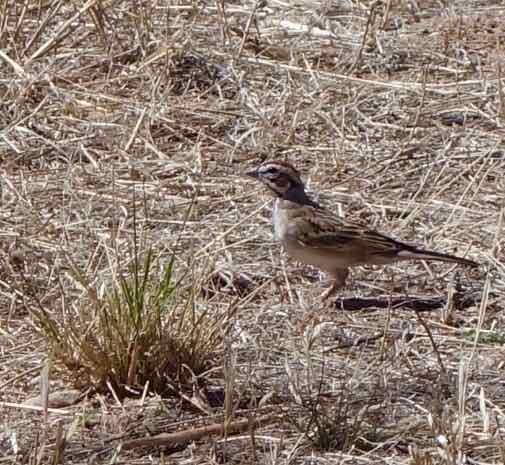 The lark sparrow kindly posed so that Nona could get a good picture of it. So, our ears helped us to look. A birds sings, peeps, or squawks, and we hear it as, “Look at me. Find me.” Our ears tell us which way and how high or low to look, and then, if we’re lucky, we see the bird. By the way, some birdwatchers are so good that they don’t have to look to know what bird they will see. They know each bird’s calls, so all they have to do is hear it. Nona and Papa aren’t there yet. I don’t want to discourage them, but, I doubt they ever will identify birds just with their ears. Still they do enjoy looking for birds. Enjoying what they do is what’s important. Greetings from the Beach! We’re in San Diego. How is it here? Well, you might say that we’re having a “gull-ing” experience, but that could mislead you. We’re just having a good time observing the behavior of a certain type of beach bum, the gull. We’ve learned to watch our food around gulls. These juvenile western gulls just heisted someone’s apple from a lunch bag! 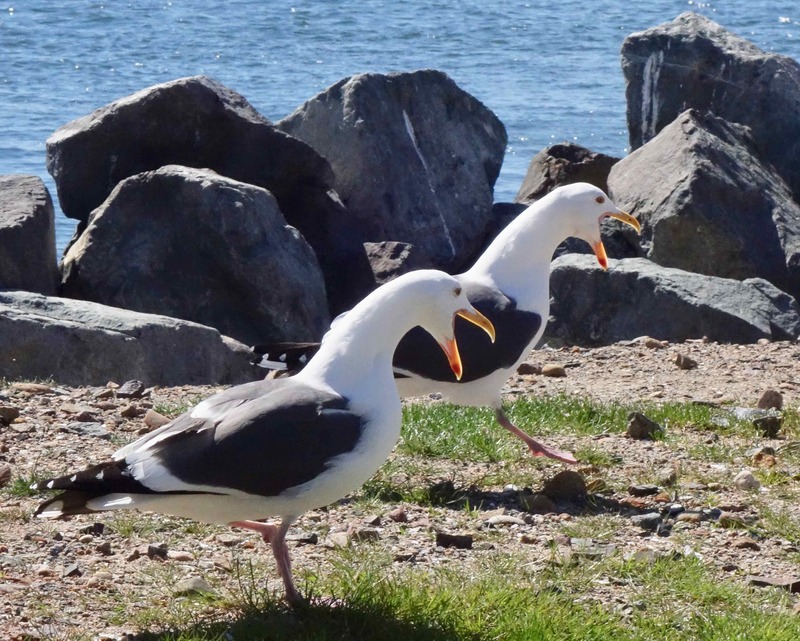 Another behavior trait that I have observed among these gulls is that they like to make noise together. Maybe they think they’re singing, but their “vocalizations” hurt my eardrums. 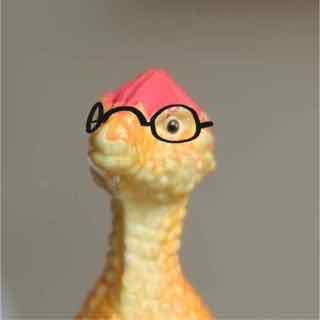 Squawking, squawking, squawking, they’re driving me crazy! I was beginning to think that gulls are just another kind of pest. Just when I was wondering how to get rid of these pests, I discovered this gull performing an important service at the beach. A lifeguard gull! Amazing. Now I’m wondering how does a gull save lives lost at sea? 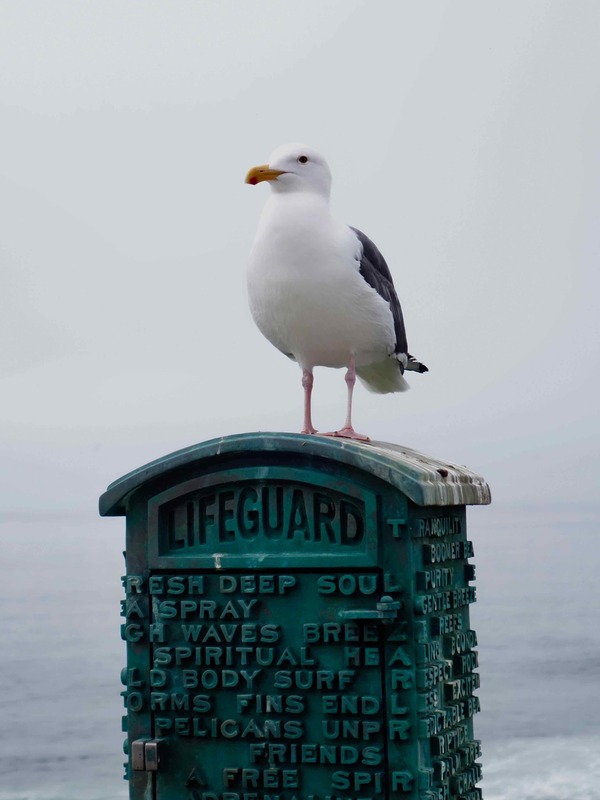 I can’t imagine, but the sign is very clear, isn’t it, identifying this gull as a “lifeguard”? 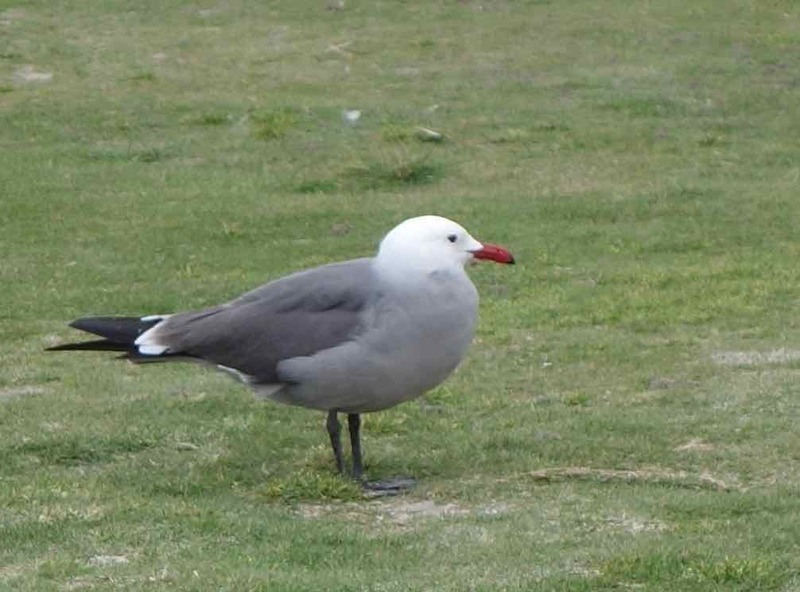 Sure enough, a Heerman’s gull — looking different — stood there proudly and apparently comfortable with the many western gulls sharing the beach with it. 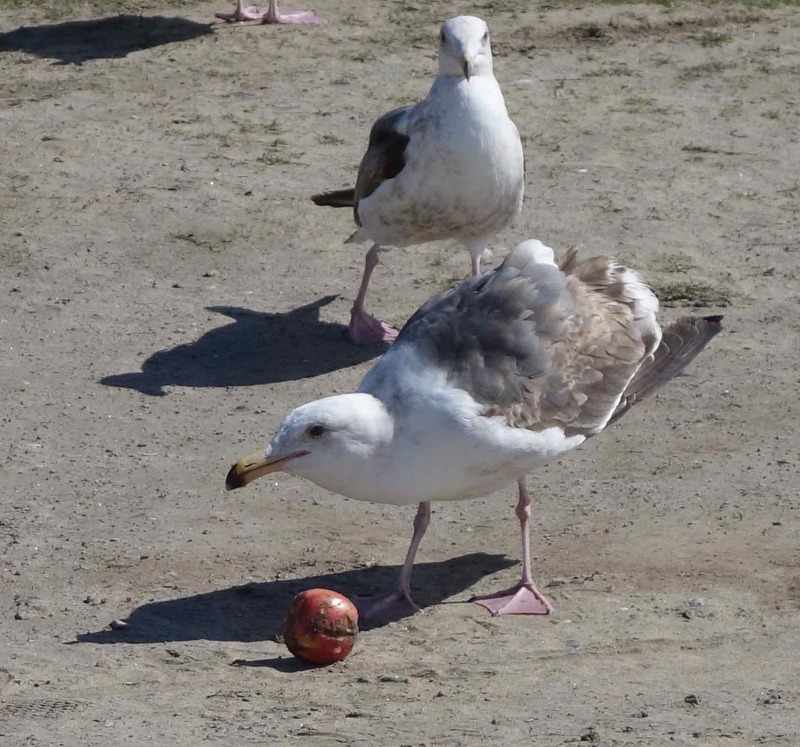 Well, squawking gulls still jangle my nerves, but I admit that a lifeguard gull and a gull that dares to be different have both taught me to appreciate gulls — even those little apple thieves amused me. “Help!” Solbit Cries Out in the Desert. Do you have any idea what it’s like to be nearly strangled in the desert? 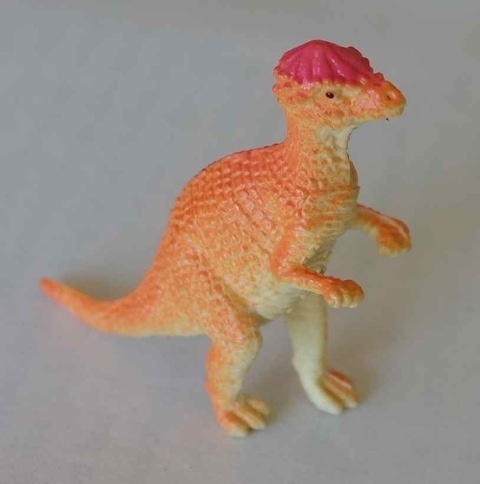 Well, I do, and I’ve got photographic evidence of the attack. 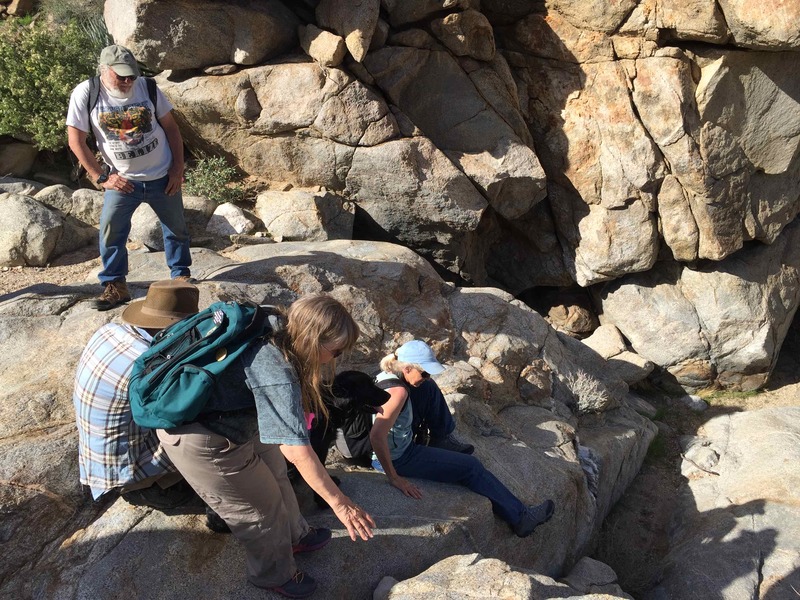 Walking along in the Anza-Borrego Desert State Park in California with Nona, Papa, and their four friends from Sandpoint, Idaho — Steve and Elizabeth and Bob and Marty — I felt completely at ease … and safe. 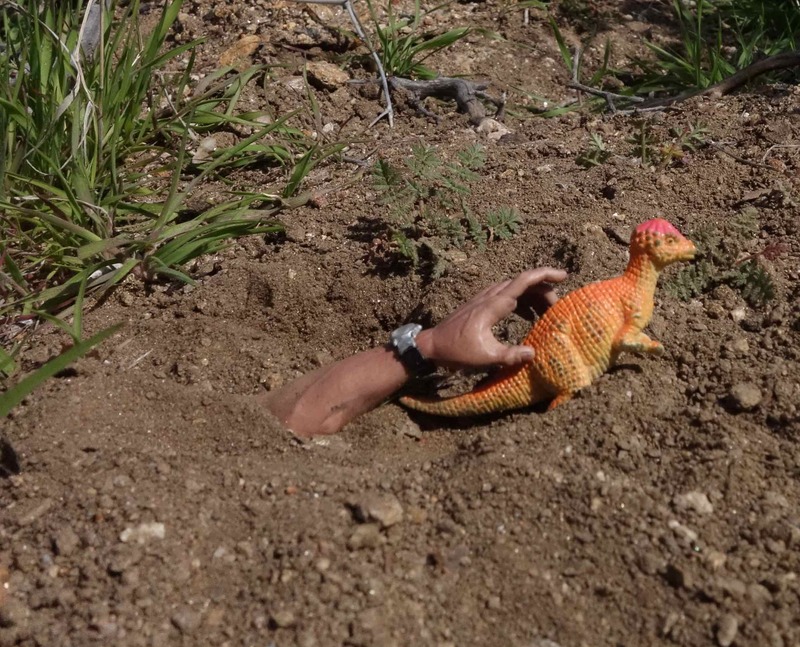 Then I saw something in the dirt, and, well, you know that I am inquisitive, so I went over to take a look. “What’s that?” I wondered and wandered over to get a closer look. Then swish, bam, before I realized what was happening this anonymous hand came at my neck. “OK, Solbit, that’s a take,” our friend Bob said. “Well, done.” Everyone applauded my performance, and, truth be told, I am a good actor. Yes, we were just play acting. What fun! What you see is not always what you get. Get it? 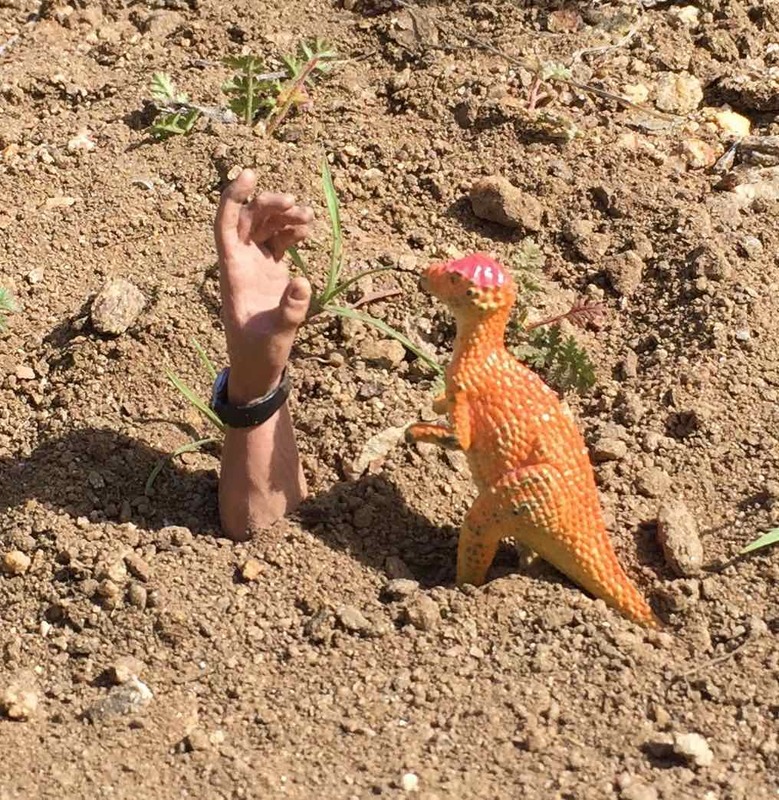 We staged these photos, just for fun. After that scene, we all sat around on the rocks and had a snack and some water to drink. Then we hiked back down to town. “I had no trouble getting down the canyon. Just hitched a ride in Nona’s pocket! She and the others did slip and slide, though. You know what I learned today from our hike with our friends? I learned that you don’t have to be a kid to kid around and have fun. Even grown-ups enjoy play acting!